Winning the Big East regular season despite having lost four stars to the NBA draft might be Jay Wright's greatest accomplishment. What if last season’s Villanova team had played in this season’s Big East? The Wildcats might have easily gone undefeated in league play, and that’s no particular knock on the five Big East schools that beat Villanova this season. That’s just the difference between what coach Jay Wright had a year ago and what he has been able to construct this year. It’s also the difference between what was a pretty strong league and one that is now going through a bit of a lull. In some ways, Wright, who was announced as Big East coach of the year Wednesday, has put on a master class in coaching as the Wildcats came off their 2018 national-championship run and saw their top four scorers taken in the NBA draft. The combination of Jalen Brunson, Mikal Bridges, Donte DiVincenzo, and Omari Spellman was more than just the 60.7 points per game that disappeared. They represented the entire “Villanova Basketball” trope of relentless defense, selfless play, leadership, and dedication to team above individual. The transition was expected to be more gradual, but the Wildcats did win the national championship, and DiVincenzo, a redshirt sophomore, and Spellman, a redshirt freshman, were projected as first-round picks. That left Wright scrambling. 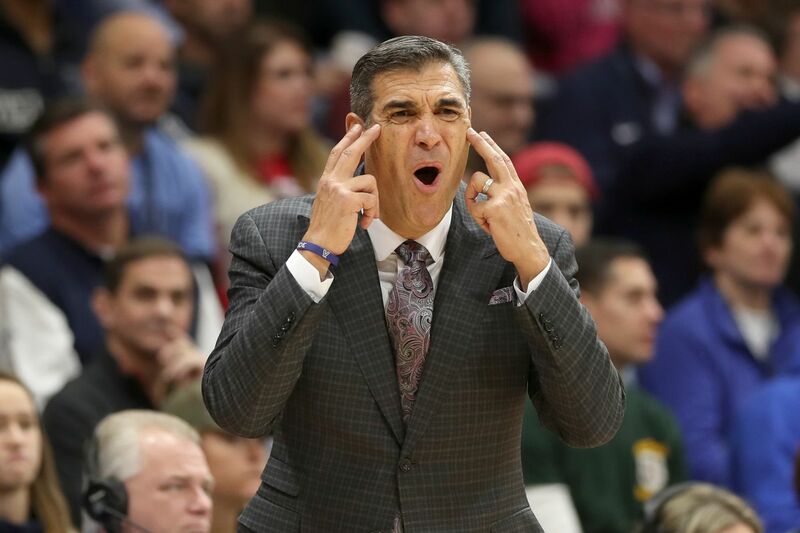 After a five-season stretch in which Villanova went 165-21 and won two national championships, nobody was going to feel sorry for the Wildcats if they were caught short, or blame Wright if his team suffered the predictable downturn after such heavy losses to the roster. The first challenge was filling the nest again. Wright brought in graduate transfer guard Joe Cremo from Albany for his final year of eligibility, and recruited forward Saddiq Bey, who had rescinded a letter of intent to North Carolina State. Those additions didn’t become official until August. Earlier in the year, Villanova scooped up five-star-recruit point guard Jahvon Quinerly, who was available because of a major recruiting violation at Arizona. The incoming freshman class also included forward Cole Swider, who would average nearly 10 minutes per game before breaking a bone in his hand in January. Saddiq Bey (15) was one of Villanova's new additions after last year's championship team. Juggling those additions, Wright knew that sophomores Collin Gillespie, Dhamir Cosby-Roundtree and Jermaine Samuels would have to at least double their minutes load from the season before. Bey might have been the biggest surprise. In his bio from the team’s yearbook, it says, “Will vie for minutes as newcomer as he works to acclimate himself to the Big East.” That’s usually code for “not this year.” Bey ended up averaging 29.4 minutes for Villanova. This unproven mix was anchored by guard Phil Booth and swingman Eric Paschall, both steady and talented fifth-year seniors, but, man, it was a lot to ask for all that change to produce success. “We’re still trying to figure it out,” Wright said often during the season. They figured it out enough to finish 22-9 overall and 13-5 in the conference, earning the top seed in the tournament for the fifth time in the last six years. The current team scored 12 fewer points per game than last season, but also gave up three fewer as the Wildcats slowed the pace by default. Their overall field-goal percentage dropped, as did their three-point percentage, and both those numbers rose for opponents. In other words, it’s been a different year. At the moment, pending the conference-tournament results, Villanova and Marquette are the only sure things from the Big East for the NCAA Tournament, slotted somewhere in the neighborhood of fifth or sixth seeds. They are the only two schools from the Big East rated among the top 50 programs by the NCAA NET rankings that will largely determine the bracket. It is the same number of top-50 programs as the Ohio Valley Conference, Mountain West Conference and Southern Conference. According to NBAdraft.net, there isn’t a single Big East player who will be taken in the first round of the professional draft. Villanova had three all by itself last year. So, it’s been a good season to be figuring it out with a very young roster and an altered style of play in the Big East. The league was a little more forgiving this time around. As always, Wright’s timing wasn’t bad. At least for this week, Villanova will still be swimming with the sharks. Next week, the water gets deeper.